This week will see most of the nation’s workers’ compensation cognescenti at the Workers’ Compensation Research Institute’s annual conference in beautiful downtown Brahmin Boston, the home of the bean and the cod, where the Lowells speak only to Cabots, and the Cabots speak only to God. This is WCRI’s 34th annual conference, and it sports an agenda that should satisfy even the geekiest of data geeks. To me, two things stand out. First, if you’re coming to my home town expecting not to hear much about drugs, I submit you’ve been living on another planet. Three of the eight total sessions address drugs: two on opioids, one on Medical Marijuana. 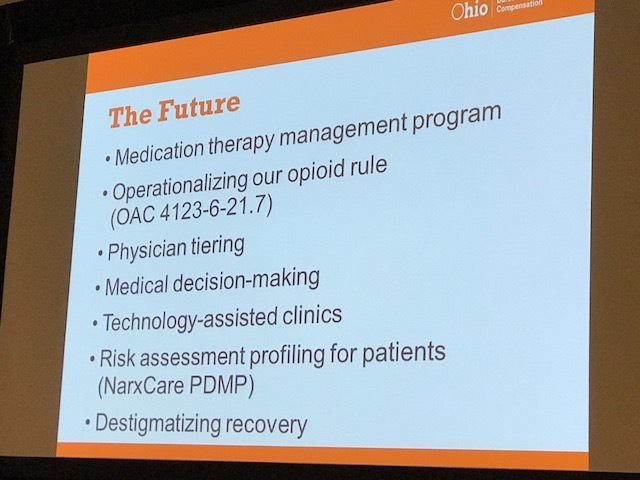 Dr. Terrence Welsh, Chief Medical Officer at the Ohio Bureau of Workers’ Compensation, will detail Ohio’s successful program aimed at reducing opioid dependence among injured workers. 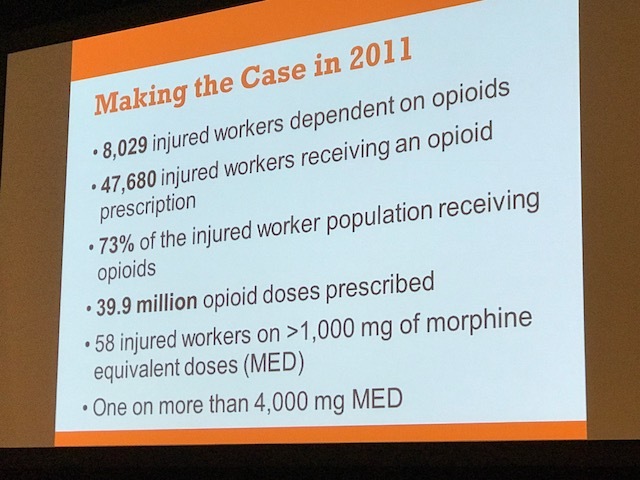 In 2011, the Ohio Bureau of Workers’ Compensation (OBWC) found that more than 8,000 injured workers were opioid-dependent for taking the equivalent of at least 60 mg a day of morphine for 60 or more days. 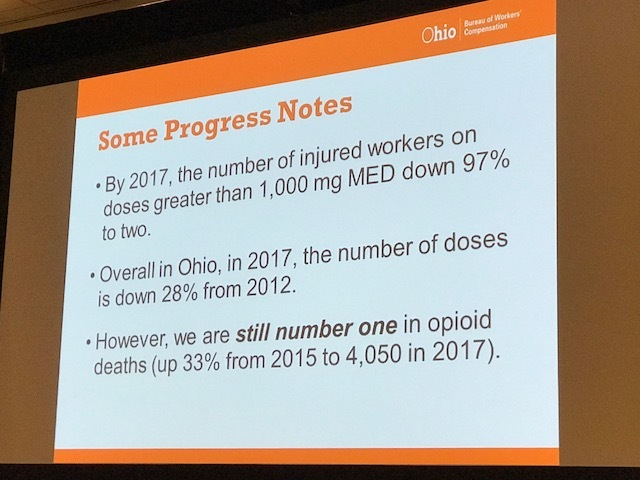 By the end of 2017, that number was reduced to 3,315, which meant 4,714 fewer injured workers were at risk for opioid addiction, overdose, and death than in 2011. After years of thumb-twiddling, other states have made great strides in combating opioid dependence in workers’ compensation, California and Washington State to name just two. But because workers’ compensation is state-based, there’s no national workers’ compensation solution; every state is on its own. Most are actively engaged in building programs to reverse the deadly trend, but workers’ compensation is only the tiny caboose on the back end of the great big American health care train(wreck). Nationally, the health care industry doesn’t seem to be having as much success as workers’ compensation’s committed leaders. Evidence: U.S. life expectancy at birth dropped in 2015 for the first time since 1993 during the AIDS epidemic. The years 2015 and 2016 saw the first consecutive two-year drop in life expectancy at birth since 1962/63 (generally attributed to an epidemic of flu). The two-year drop in American’s life expectancy is primarily due to drug deaths. In 2015, the nation suffered 52,400 drug overdose deaths. That’s more people than were killed in car crashes in any year since 1973. In 2016, the total rose to 63,600, more than were killed during the entire Vietnam conflict, which lasted more than a decade. 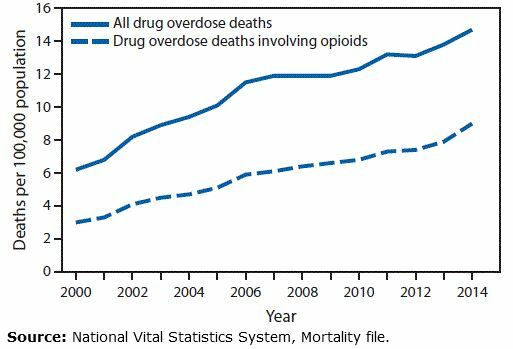 Drug deaths for 2017 appear to be even higher, although, because drug deaths take a long time to certify, the Centers for Disease Control and Prevention will not be able to calculate final numbers for 2017 until December. No other country in the OECD has seen a drop in life expectancy in recent history. Does Dr. Groshen see any correlation between stagnant hourly wage growth and workers’ compensation’s declining injury frequency and loss costs? If this is a current unknown, should WCRI study it? If not WCRI, then who? Between 1948 and 1973 there was a one to one correlation between productivity and wages. However, since 1973, productivity has risen nearly 75%; wages about 9%. How does Dr. Groshen see this playing out in the next decade? Two final thoughts about the upcoming conference. I know time is limited, but I wish WCRI had allotted one session to Artificial Intelligence and Machine Learning and their impact now and in the immediate future on workers and workers’ compensation. Artificial Intelligence (AI) continues to gain significant momentum throughout industry. The workers’ compensation industry is ever so slowly increasing the bandwidth of its AI capability, but it still seems to lag far behind other industries in embracing much that AI has to offer. Speaking of AI, IBM Q, the creator of Watson, put a 5 cubit quantum computer prototype in the cloud in 2016 and two months ago unveiled a 20 cubit quantum computer available to its clients and a prototype 50 cubit quantum computer. Unlike current computers, which perform operations sequentially, quantum computers perform many operations simultaneously. An operation which currently can take days, or even weeks, will be done on a quantum computer in minutes, or even seconds. I would love to see the massive brain power at WCRI turn its attention to this fascinating area and its potential impact on the labor force and workers’ compensation. Medical Care Experts: Where Would We Be Without Them? If you’ve been following the blog-o-sphere and the LinkedIn-o-sphere, you know that the space is crowded. Lots of workers’ comp practitioners have glommed on to the idea that the way to get ahead is to write and post frequently. Connect with more than 500 others in the profession. Write something, anything, put your name on it and throw it up against the wall to see if anything sticks. Kind of the way Garrison Keillor used to say he changed socks on a book tour. Every once in a while, something helpful and interesting appears and gains a bit of temporary caché for itself and for its author. 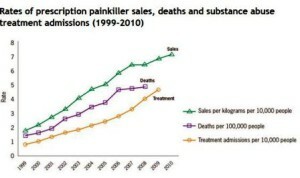 Mostly, the topics center on the persistent rise in medical costs and, even more often, on the insidious and often criminal use of opioids, which a regrettable number of alleged doctors, having checked their Hippocratic Oath at the door, are prescribing at a hell-bent-for-leather rate at a hell-bent-for-leather profit. The poor, unfortunate souls for whom these scripts are written are nothing more than high-cost collateral damage. Consequently, efforts to control workers’ compensation costs are now almost entirely dedicated to reining in costs associated with medical care with a huge emphasis on prescription drugs. And why not? Injury frequency continues its 13 year, asymptotic approach to zero. While the same can’t be said for injury severity, these are, nonetheless, heady times for insurers. Kind of hard not to make money when the combined ratio is in the 90s. Regardless of how good things are getting in workers’ comp world, the workplace is still the best place to control and manage the work injuries and costs that are bound to occur despite frequency’s decline and the rise of the robots. But that requires educated employers who understand that they, not the vendors to whom they outsource payment responsibilities, are the hub of the workers’ comp wheel. Who approach workers’ compensation in a Management 101 kind of way understanding that a systemic, accountable process will reduce costs to a minimum and bolster profits as well as employee morale and productivity. This means training supervisors in the proper response to work injuries, keeping close communication with injured workers, creating good relationships with treating physicians, bringing injured workers back to work as soon as possible under medical supervision, seeing that injured workers receive full pay while on modified duty, and measuring success every month just as one measures success in every other business enterprise. These, and other program components, give enlightened employers a distinctive competitive advantage, and the results will speak for themselves. But not all employers are enlightened; many have lost their way. Why? Well, could it be we took a system we had made relatively simple for employers to manage (and let’s not forget that it is employers who ultimately pay the bills) and made it progressively more complicated with progressively more vested interests? Many middle market employers, realizing they have no hope of navigating the haunted house maze medical care has become, have relinquished control to a myriad of vendors, the “experts.” Climbing this Tower of Babel is beyond them. The question is: Can we do anything about this? Should we? Or, has this ship long ago sailed? Posted in Best Practices, Medical Issues | Comments Off on Medical Care Experts: Where Would We Be Without Them? The surprising overdose death of acclaimed actor Philip Seymour Hoffman has put a spotlight on a national epidemic: prescription drug abuse. In workers’ comp, prescription drugs have been an area of great concern for a number of years; so too in the public health and policy arena. But has the message — and the necessary education — filtered to the general public? It would seem not: According to the CDC, prescription painkiller overdoses nearly quadrupled in the decade from 1999 to 2008. “Dr. Jason Jerry, an addiction specialist at the Cleveland Clinic’s Alcohol and Drug Recovery Center, estimates that half of the 200 or so heroin addicts the clinic sees every month started on prescription opiates. “Often it’s a legitimate prescription, but next thing they know, they’re obtaining the pills illicitly,” Dr. Jerry said. In many parts of the country, heroin is much cheaper than prescription opiates. “So people eventually say, ‘Why am I paying $1 per milligram for oxy when for a tenth of the price I can get an equivalent dose of heroin?’ ” Dr. Jerry said. 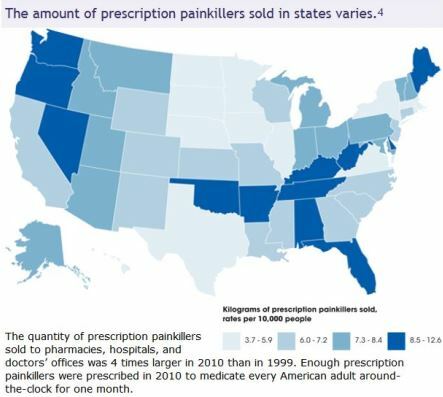 According to this report, Once occupying the ignominious position of first in the list of states with prescription drug abuse, Oklahoma is now #8 on the list. In 2012, 844 Oklahomans were killed by overdoses, eclipsing the year’s 708 traffic fatalities. The state has a real-time Prescription Monitoring Program that is reported to be one of the best in the nation, but doctors are not required by law to check the database before prescribing controlled dangerous substances. There was an average of 68 prescriptions per patient. Oklahoma is also seeing a steep rise in heroin use, echoing the concept and experience that opioids are the gateway drug. “Hal Vorse, a physician who treats habitual drug users and teaches new doctors about addiction at the University of Oklahoma Health Sciences Center, said he’s seen the phenomenon in his own practice. But he also points out that more progress is needed: Why don’t workers’ comp payers have pharmacists on staff?. “I’m only aware of three major work comp insurers (Travelers, BWC-Ohio, Washington L&I) that have pharmacists on staff; the North Dakota State Fund does as well. With pharmacy costs accounting for somewhere around 15% of total medical spend, that seems like a “miss”. Yes, pharmacy costs have been flat in recent years, but the impact of drugs on work comp claim duration and the medical and indemnity expense associated with long-term drug use is quite significant. 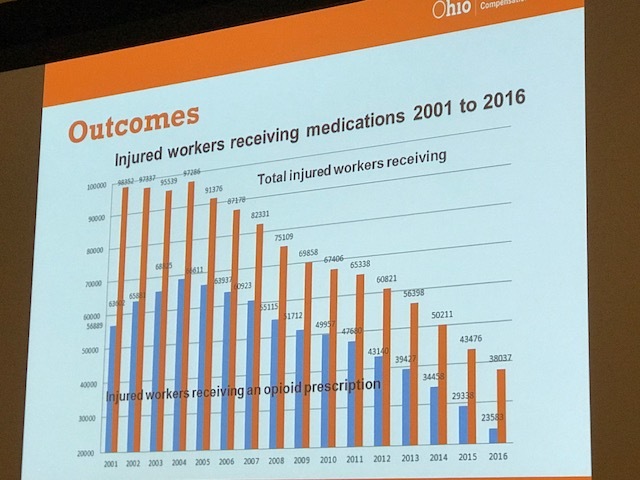 We have been tracking the compelling issue of compensability in drug overdoses within the workers comp system. We have blogged drug-induced fatalities that are compensable (Tennessee) and non-compensable (Ohio and Connecticut). Given the prevalence – make that rampant over-use – of opioids in the workers comp system, prescription drug abuse is an issue with profound implications for injured workers, their employers and the insurers writing workers comp policies across the country. Which brings us to the saga of Bruce Ferguson-Stewart. He was injured on May 25, 2004 while working for AltairStrickland, an industrial contracting firm in Texas. A bolt weighing several pounds fell from above, striking Ferguson-Stewart and injuring his shoulder and neck. The MRI showed “minor disc bulges” at three levels on his cervical vertebrae. His treating physician diagnosed him with a left shoulder contusion and prescribed hydrocodone as part of the treatment plan. The doctor also recommended surgery to repair the shoulder. For reasons that are not clear from the trial documents, the claim was denied by Commerce & Industry Insurance, the employer’s carrier. The carrier lost the initial appeal and then lost again. The insurer then sought judicial review of the Division-level finding of compensability. On October 3, 2004, while his worker’s compensation claim was still being contested, Ferguson-Stewart died from an overdose of hydrocodone. His blood contained a hydrocodone level of 0.38 mg/L, which is consistent with acute severe toxicity. The blood also contained carisoprodol, a prescription muscle relaxant, and marihuana. Ferguson-Stewart’s widow filed for death benefits under workers comp, but the case was denied. The widow appealed. At trial, Ferguson-Stewart presented two theories as to how and why Stewart might have unintentionally or unknowingly ingested a lethal dose of hydrocodone. First, in what CIIC describes as the “accidental overdose” theory, Ferguson-Stewart alleged that the overdose must have been accidental because her husband did not intentionally or knowingly commit suicide. they were overdosing due to the chronic pain. already took it. You can’t take it again.” And usually he would agree with me; but there were times when he would say, “No. No. No. I didn’t take it. I’m sure I didn’t take it. I’m still hurting too bad, and I don’t remember taking it.” So, he’d take it again. wasn’t–like I said, he wasn’t himself at all. result from medical treatment instituted to relieve the effects of his compensable injury if the death results solely from a claimant intentionally or knowingly failing to comply with his doctor’s instructions[emphasis added].” The jury concluded that Ferguson-Stewart’s death was unintentional, resulting from the treatment for his compensable injury. The widow was granted death benefits. Under Texas law, compensability hinges on Ferguson-Stewart’s intent: was the death an intentional suicide or was it an accident? He had no intention of killing himself, so the death was compensable. In a somewhat similar Connecticut case (see above), the overdose was the result of the deliberate (and illegal) act of using a needle to ingest drugs. That case was denied. Behind every death due to prescription drugs lies a story worth telling. Powerful and effective pain killers are transformed into instruments of death. When it comes to the compensability of these cases, disorientation and confusion are not limited to injured workers experiencing pain. The medical and workers comp systems struggle with the ambiguous legacy of medications: while opioids offer immediate, short-term relief from pain, the relief is followed all-too-often by a downward spiral of addiction and dependency. I truly wish the testimony of Ferguson-Stewart’s widow could be played in the examination room of any doctor about to write a script for an “East Texas cocktail.” The doctor just might consider a more benign and less toxic alternative.